"Pocket Kingdom" is an authentic throwback to the Amiga era! 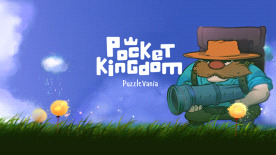 Challenging puzzles, sleek pixel art graphics and awesome chiptune soundtrack makes of Pocket Kingdom an unparalleled journey. Unlock access to new areas by collecting objects scattered here and there. Trick gravity, discover helpful devices and listen to the weird stories told by the locals. Getting out of Pocket Kingdom depends on it. So does unveiling the place's mysteries.